By now, many of you have probably seen the Cloud Foundry webinar and Rod’s blog from earlier today. I’d like to provide a quick follow-up that features a “hello-spring” sample application deployed in the cloud. Thanks to Cloud Foundry, there’s practically no learning curve at all. Simplicity and Productivity: Deploying a Spring application to the cloud is as simple as dragging and dropping within SpringSource Tool Suite, and even when building an application to run in the cloud, developers can take advantage of the productivity gains enabled by Roo and Grails exactly as they normally would. Consistent Innovation: Projects like Spring Social and Spring Data embrace innovative technologies such as Twitter and non-relational data stores that are increasingly popular for cloud-based applications, and they do so in ways that are consistent with the existing Spring platform. Cloud Foundry provides services to support such applications. RabbitMQ will be available as a cloud service soon, so the same applies to applications that rely on RabbitMQ for messaging via Spring AMQP and Spring Integration. Portability: The cloud is first and foremost a new deployment environment, and yet it’s easy to create an application that can run in and out of the cloud without even swapping configuration files. With those goals in mind, we’ve designed a sample application that provides an introduction to Cloud Foundry for Spring developers. This is the first of many sample applications that will be featured on this blog over the following days and weeks. It demonstrates how a single configuration can support both local testing and cloud deployment. It also demonstrates services available in Cloud Foundry: MySQL, Redis, and MongoDB. Let’s quickly walk through the actual deployment and then work backwards to the configuration. The first element will create a bean of type java.sql.DataSource, and the second will be injected with its that reference to satisfy its dependency. That’s pretty much all you need to know in order to deploy a new application into the cloud and provision services. However, we also want to test the application locally. 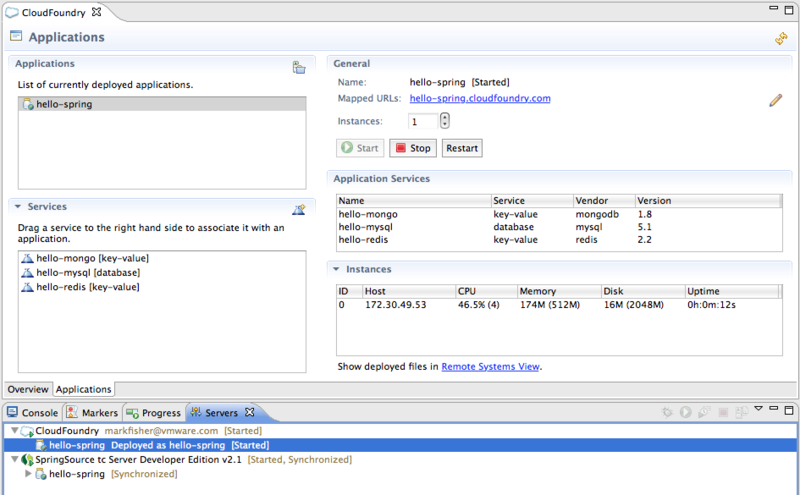 Thankfully, the forthcoming Spring 3.1 release offers some assistance here via Spring profiles. The “profiles” feature in Spring 3.1 – explained very clearly in this recent blog by Chris Beams - enables you to “switch on” certain beans at runtime. This can be quite useful when you want to associate beans with particular environments. Similar functionality is possible using Spring’s property placeholder resolution mechanism to vary the definition of objects based on external properties. But this is different: suppose for example that you want to use the <cloud:data-source/> element in the cloud, a regular DriverManagerDataSource defined as a <bean> on localhost and a DataSource retrieved through JNDI in integration testing via <jee:jndi-lookup/>. Spring profiles makes it easy to associate each of these beans with a profile, so that – while all three are defined in the configuration – only one is active at any time based on the environment. Spring provides a few pre-packaged strategies for enabling profiles. One is to use command line system properties. However, if you need to dynamically set the active profiles based on information that is known only at runtime, then consider using an ApplicationContextInitializer implementation, as described in this other post by Chris Beams. The nested <beans> elements and their “profile” attributes are the only new Spring 3.1 features in use here. The nested beans element lets us specify that any beans contained therein should be enabled only if the designated profile is active. The hello-spring example shows all of this and more, and it can be cloned from this repository. The most important characteristic of the application is that it can be dropped onto either a local server, such as the tc Server instance available within STS, or to the new Cloud Foundry server. That’s all for now, but watch this space. We have many more sample applications (watch this repo) and blogs planned in the days and weeks ahead!